Dental implants, while popular in restoring teeth, are not ideal for all patients. 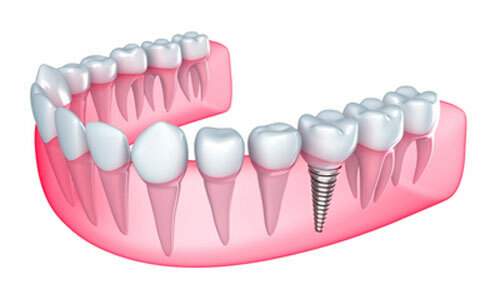 Patients who are missing one of more teeth ask us from time to time about getting a dental implants. The implants are surgically placed into the jawbone and hold a replacement tooth. Who is a good candidate for implant surgery and what do we look for in a patient to make sure they're compatible with the procedure? Let's explore that question further. Healthy gums and good bone density- Dental implants will come in direct contact with your gums and jawbone and it is imperative that you have good oral hygiene and are free of gum disease. Bone density is needed because the jaw needs to adequately support the implant. Good oral health is required for anyone being treated for a dental implant. While we understand that you're here because you lost a tooth, we want to be sure that you are capable and willing to maintain good dental hygiene during your recovery time and after you receive your implants. Time is another commodity that we prefer to see in a patient. In addition to the healing process, which can take anywhere from a few weeks to a few months, depending on what procedures need to be done, it is a multiple visit process. Dental implants take time. Other factors to take into consideration, nonsmokers, or patients who are willing to stop during the process are preferred. Patients also must not suffer from any disease or disorder that will prevent the body from healing. If you think that you may be a good candidate for dental implants, give our office a call and we'll set up a consultation with you soon!